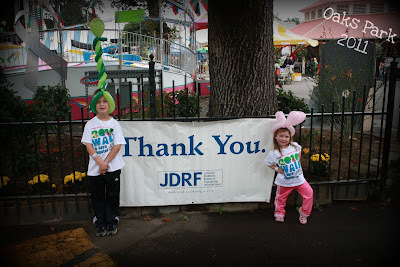 I decided at the very last minute that the family(just the 4 of us) would go to Portland for the JDRF Walk to Cure Diabetes on Sunday(October 2nd 2011)I did not feel like celebrating diabetes at the moment(it's been a tough year)....however I decided to register Ava as a walker because this is about her not me and about awareness, research and a sense of belonging. Ava may never see a cure but I hope that someday no other parent has to live with this disease in their home. We called about 6 weeks before the event to get into our Dr while we were there and they had to put us on a cancellation list. Well it all worked out they called us Friday (yes the day before we left) to let us know they had an appointment on Monday at 10! Sign me up! So glad we decided to make the trip. The walk was fun, cold as usual and a rained at the very end. Ava and Logan had a blast we didn't meet anyone new nor did we get the chance for her to make any friends(she is only 3 after all:) but I would say it was a success....as for next year we have BIG plans....Ava's Army get ready for battle!